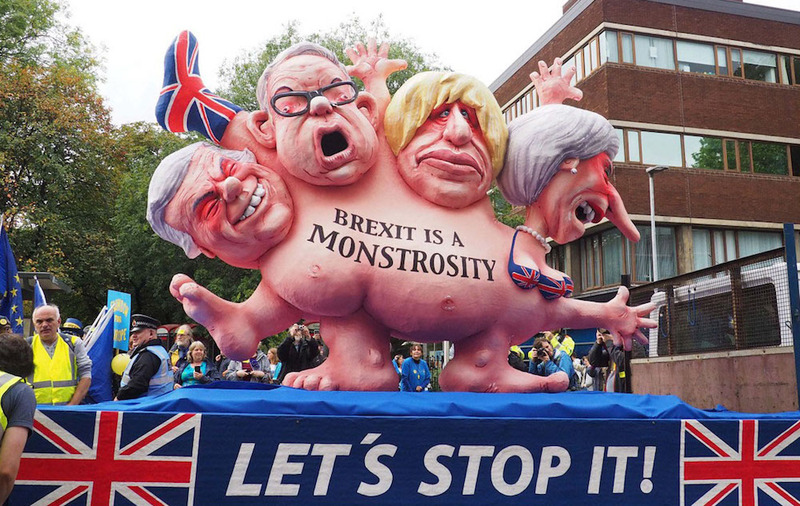 A float in an anti-Brexit demonstration depicts a monster comprising British Prime Minister Theresa May and three of her colleagues, Oct. 1, 2017. Photo courtesy of Wikimedia Commons. The brutal truth is that erecting a real border between the U.K. and the EU is nearly impossible. This truth explains why the United Kingdom keeps losing at Brexit and why it never will find an effective approach for leaving the EU. For nearly two years now, the U.K. government has pursued Brexit negotiations under a fundamentally false premise: that everything is on the table and every element of departing the EU can be worked out. Clinging to the meaningless mantra that “Brexit means Brexit,” Prime Minister Theresa May has approached EU negotiators as if on equal footing, suggesting that the U.K. will leave the EU and both parties must simply reach an agreement on how to accomplish the separation. Big issues like the rights of EU member states’ citizens in the U.K., the U.K. contribution to the EU’s current budget, the continued jurisdiction of the Court of Justice of the EU (CJEU) in the U.K. during the transition period, and the structure of the negotiations themselves—with the U.K. pressing to talk about a new trade deal before the “exit” terms were established—all have been treated as open matters to be settled. During the process to date, the U.K. has behaved as if it had leverage. Last year, British Foreign Secretary Boris Johnson smartly told EU leaders that they could “go whistle” (i.e., get lost) if they expected the U.K. to pay a large divorce bill. But time has revealed that these tactics and maneuvers rise out of a kind of delusion. The U.K. has caved on all major issues so far, and the EU has gotten everything it wants. EU citizens in the U.K. will have rights, the U.K. will pay a hefty sum to the EU, and the CJEU will maintain jurisdiction in the transition period. And the U.K. has conceded that the terms of the divorce, including a payment, must be settled before the elements of a new relationship are explored. As negotiations veer further afield from what the U.K. wants, chaos within the government and legislative branches has increased in volume and intensity. Deep rifts are splitting the Tory party. Government officials seem to take opposing stances every other day. The Labour Party appears fractured and confused. And no one knows what Prime Minister May really wants. This has happened because of a failure to recognize the magnitude of establishing a border. That failure goes back to the Brexit campaigners who, ahead of the referendum in which voters chose to leave, decided not to reckon with reality. Put simply, the political and economic difficulties for the U.K. of constructing a border with the EU are almost insurmountable. As such, the situation is akin to someone making preparations to embark on a train trip whose destination remains unknown. Should you pack for hot or cold weather? For the mountains or the beach? Under such circumstances, the ability to strategize, plan, and set priorities is greatly diminished. What makes it nearly impossible to create a new border for purposes of trade and regulation? Let’s start by recalling what the EU is fundamentally about. The EU is first and foremost a common market: a free trade area (for goods, workers, services, and capital) with a common external tariff (CET). The free-trade area means that everything within the EU can circulate freely across the member states. This has been accomplished by the removal of internal tariff barriers and a massive effort at regulatory harmonization in countless policy areas. The CET regime means that everything coming into the EU is subject to the same tariff restrictions no matter which member state imports it. The U.K. has been part of this regulatory and economic body for more than four decades, joining after realizing it did not want to be left out. Leaving now is hard to fathom and will be harder to do, for both political and economic reasons. The political challenges relate primarily to Northern Ireland and Scotland. The Irish question is the most pressing at the moment, due to the question of where the border, including the CET boundary, should be. A border between Northern Ireland and Ireland is unacceptable to the Irish, Northern Irish (including Sinn Fein), and the U.K. itself. But it would also be madness to put the border between Northern Ireland and the rest of the U.K., given that the former is part of the latter. For one thing, it would mean that the U.K. is not fully out of the EU, since Northern Ireland would remain inside the EU. For another, it would separate Northern Ireland—in tariff but also, critically, regulatory terms—from the rest of the U.K., which remains unacceptable to Northern Ireland’s Democratic Unionist Party, on whose support May depends. The logistics associated with managing that border would present another extraordinarily complicated challenge. There is, in effect, no place to put the Irish border. The political and economic difficulties for the U.K. of constructing a border with the EU are almost insurmountable. The Scottish situation has unique dynamics but is fundamentally similar. The Scots, while part of the U.K., cannot imagine being outside of the EU. Yet severing Scotland from the U.K. is not something that a majority of Scots, or Brits, want to do. On the economic side, the harsh reality is that the U.K. cannot afford to erect a new border anywhere when it comes to the EU. It is too dependent on the EU market to turn away from it. To avoid harrowing effects on its economy, the U.K. will need to stay aligned with the EU’s regulatory frameworks (currently amounting to around 50 percent of all national legislation in any one member state) and retain an essentially tariff-free relationship. And, for all this to be possible, the U.K. will have to accept, in effect, a CET or otherwise pay the EU a heavy fee for not following it. Alternative scenarios are hard to contemplate. The only thing the U.K. must decide is whether it wishes to retain some control over EU law (by staying within the EU) or not. Since Brexit means leaving the EU, the U.K. looks as if it is headed for an unenviable arrangement wherein it will be intimately connected to the EU but will have no control over its trajectory. As it turned out, on May 8 the House of Lords voted on precisely this question. It was framed as a vote on whether to follow “The Norway Model,” which involves acceptance of all EU laws, paying a hefty fee for access to its market to the tune of billions of euros every year, and accepting judiciary oversight to ensure compliance. Norway follows this framework as part of the arrangement known as the European Economic Area (EAA), to which Iceland and Liechtenstein also belong. Of course, it also means that Norway has zero control over the direction of the EU regulatory regime with which it must comply. The House of Lords’ “yes” vote forced a forthcoming vote in the House of Commons on the Norway Model. A similar vote in the lower house would set Parliament on a collision course with May’s government. All this is a far cry from a clean break with the EU. It is the opposite, and is, in fact worse than being an EU member: continued participation, meaning no border—this time with loss of control. It is time for reality to sink in and for the U.K. government and British people to accept the truth: A clean, pure Brexit is simply a mirage. The U.K. will remain deeply connected to the EU and should therefore remain a member of that organization if it wishes to retain some control over the relationship. Hubris, the vestiges of imperial superiority, and false promises brought the Brexit idea about and have muddied the path forward. Honesty and decisiveness can clarify the next steps. Francesco Duina is professor of sociology at Bates College in Lewiston, Maine. He is the author of several books on nationalism and globalization, including Broke and Patriotic: Why Poor Americans Love Their Country (Stanford University Press, 2018).